TuffStuff’s CXT-200 Corner Multi-Functional Cross Trainer is a great space saver. Incredibly compact, it boasts optimum space efficiency having been designed to fit into a corner. 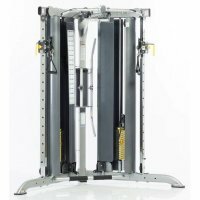 A patented built-in weight resistance conversion (WRC) device converts the resistance to full or half of the selected weight on the fixed lat and low row stations of the machine. The TuffStuff CXT-200 Corner Multi-Functional Cross Trainer features a fully adjustable high/low pulley system with a swivel rotating handle. Useful for anyone wanting to work out at home, the machine is particularly suitable for people with physical disabilities and for people undergoing rehabilitation after an injury or sever illness. The wide base of the frame is easily accessible for wheelchairs, as well as for rehab equipment, workout benches and for stability balls. Compact design: You can accommodate the cross trainer in the corner of any room. Frame: Stable and secure and suitable for those who are physically challenged. Weight stacks: Two, each containing 150 lb. Frame: Manufactured using 11-gauge 2” x 3” oval tubing and 2” x 2” round tubing. Upholstered cushions: High-density units covered with premium grade, double-stitched naugahyde. Pulleys: Made from fiberglass reinforced nylon with sealed bearings. Finish guide rods: ¾” solid steel rods with a hard chrome finish. Adjustment pins: ½” push-pull spring-loaded solid steel. Fasteners: Bolts and nuts made to ANSI specifications. Weight and size: 42”L x 80”W x 84”H (107 cm x 203 cm x 213 cm); shipping weight 530 lb (240 kg). Certification: Made in the USA; certified 2,200 lb test 3/16” military-spec nylon-coated cable. Warranty: Lifetime on everything to the original purchaser when used only in a home environment. 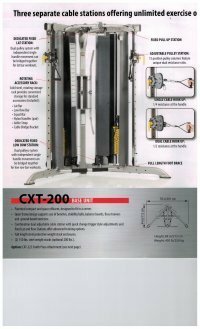 CXT-225 Smith Press System Attachment: Provides a 7-degree pressing movement; heavy-duty self-aligning linear bearings system; built-in safety spotters; space-saving angular Olympic plate holders (weight plates not included). CDM-400 bench: May be used with the chest fly.